Thanks to Tina for her Lens Artists Weekly Photo Challenge 24: Seasonal. What is more seasonal than a holiday greeting card?. Thanks to Debbie for her Travel with Intent Challenge – One Word Sunday: Christmas Time. Even the Heron gets in the holiday spirit. Great blue heron foraging on the shore in Autumn. Thanks to Patti for her recent Lens Artists Weekly Photo Challenge 17: Just for Fun. This photo is not a ‘funny’ photo, but my idea of great fun is floating on the water, admiring the Herons through binocs. Thanks to Dawn for her Festival of Leaves: Week 6. This Heron calmly foraged along the shore, and ultimately caught a large Bass of the size that would make any fisherman envious. Thanks to Su for her (The) Changing Seasons Challenge. I hope a second submission to Su’s delightful Changing Seasons is allowed. There is somwething universal about the way Nature morphs from one into the next, and also in the way humans respond. People commiserate about frigid temps and too much snow, and whine about excessive heat, but almost universally we delight in the lovely bursting forth of spring and the glorious colors of autumn. This waterfall is no more, sadly. Thanks to Debhie for her a Six Word Saturday. The falling waters shown here are a thing of the past, now. The base of the falling water was a popular spot for Herons and Red Tailed Hawks to fish for their supper. Thanks to Dawn for her recent Festival of Leaves: Week 5. I spent many hours over 7 or 8 years hidden in my kayak across the channel from this spot in hopes of capturing a Great Blue Heron with the striking autumn leaves. Good things come to she who waits. Thanks to Cee for her recent CFFC: Vibrant Colors. I have no idea what those vivid red leaves are. Thanks to Paula for her Thursdays Special: Pick a Word in October: Gushing . Depending on the day, the falling waters gushed down the hillside. Great blue heron profile in Autumn for Wordless Wednesday. Thanks to Cee for her recent CFFC: Pastel Colors. The autumn leaves are muted, not yet at peak vibrancy. Thanks to Dawn for her recent Festival of Leaves: Week 5. This Great Blue Heron is in the habit of following the sunlight as it moves across the cove, much the way a cat will seek out puddles of sun indoors. Great blue heron in the Charles River in Autumn. Now in its 18th year, Natick Artists Open Studios is comprised of over 80 artists who live, work or show in Natick. We are committed to bringing art to the local community by opening our studios and welcoming conversations about the experience of creating art. We offer the opportunity to see art, learn about how it is made, and buy local art directly from the artists. Participants include painters, photographers, jewelry makers, ceramicists, sculptors, woodworkers as well as paper, fabric, glass and garden artists. Wherever you live, whatever your community, please support your local artists. The world is richer for their presence. Thanks to Cee for her recent CFFC: Places People Visit. Not only do the Great Blue Herons visit the Charles River in autumn, so do people. In fact, a quick internet search shows many old postcards of throngs canoeing the Charles near Boston. More than a hundred years ago it was quite a thing. Thanks to Debbie for her recent Travel with Intent: Blue. Does a Great Blue Heron count as being blue? I won’t quibble here, but they say that the color blue in feathers is an optical illusion, caused by refraction. Have a look at the masthead art at the top my blog. That is a photo I took of an aigrette feather from a Great Blue Heron. There is nothing blue about it. Thanks to Dawn for her Festival of Leaves: The Orange on the Side of the Road. Does the ‘orange on the side of the river’ instead of ‘at the side of the road’ count? I hope so. Thanks again to Paula for her Thursday’s Special: Pick a word in October. More than a hundred years ago, this stretch of the Charles River was on the frontier of semi-urban canoeing. Just maybe, this Heron is a descendant of those that people watched from long-ago paddles. Great blue heron preening on log in Autumn. I get Fall Fever each year the way some get Spring Fever. The crisp air and scents of autumn are invigorating. I love how the landscape at the lake is transformed by the progression of leaves from their summery greens to shades of orange, yellow, and red. Not to mention great sleeping weather. After the sultry, sweltering nights of summer, great sleeping weather is its own cause for celebration. Thanks to Dawn for her Festival of Leaves: The Orange on the Side of the Road. I get fall fever each year, the way people get spring fever. Thanks to Cee for her recent CFFC: Reds. Maple Trees often have vibrant red, orange, and yellow leaves, and it is not often that I can capture a Great Blue Heron in the fall with the beautiful leaves as backdrop. Thanks again to Paula for her Thursday’s Special: Traces of the past. This photo was taken 5 years ago this week. The autumn leaves are not yet that vibrant in the cove this year. 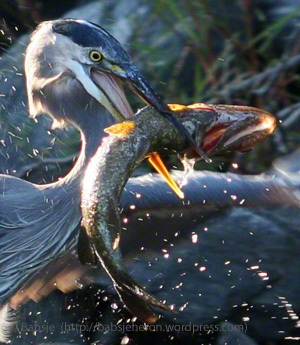 No Mink were harmed in the making of this post, so please don’t get all #PETA on the Herons. Speaking of PETA, during her high-school years, a friend’s daughter worked in a now-defunct local shop that sold fur coats on consignment. She delighted in hiding a card from PETA deep in the pocket of as many furs as possible. The Mink shown here is the first I’ve ever encountered – in more than a dozen years on the lake. It was late in the day. I was heading for home and apparently the Mink was, as well, when we met eyeball-to-eyeball beneath the tunnel. Looking at the Mink’s lustrous pelt, it is not difficult to understand why their fur has been so sought-after over the ages. Thanks to Cee for her recent CFFC: Things People Grow Challenge. Farming “American Minks” was a thing in the UK, driven by greed no doubt. Unfortunately, many farm-bred Mink escaped and they are now considered an invasive species in the UK, where they are a threat to waterfowl and other creatures. Thanks again to Paula for her WPC: Pick a word in September challenge: Cavernous. This Mink appears tp make it’s den in one of the cavernous holes among the rocks. The secret is to stay present always, to not take nature for granted no matter how often we think we are seeing the same ol’ same ol’. That Saturday, I was tired, and the journey back to the home dock would take another hour and a half. I had already bagged a fair number of Great Blue Heron captures and was eager to take out. From a distance, I gave a passing glance at the southern shoreline and saw the usual pair of Mute Swans floating in their usual spot, and so I paddled on. Rounding the curve below the Labs, coming closer to the Swans, I noticed an odd-looking thrashing and splashing unlike any Sawn behavior I’d seen before. Binoculars up, I sat transfixed, watching from across the channel as one of the Swans took a Saturday bath. Amazing. Many of us have seen Robins, or Warblers, or other small songbirds splashing about in a backyard garden birdbath. Now, imagine a bird with a 7-to-8 foot wingspan behaving just the same – dunking their head and neck fully below the surface, coming back up to shake off the water, rearing up on legs, wings akimbo flapping and expelling droplets galore, and preening, preening, preening to sort out feathers. The Swan’s bath lasted more than 15 minutes. I wouldn’t have missed it for the world. And so, as I said before, the secret is to stay present always, to not take nature for granted no matter how often we think we are seeing the same ol’ same ol’. View other large birds bathing: Red Tailed Hawks aka Beauteous Buteo and a Great Blue Heron aka Rubber Ducky You’re the One.